I bought this tent a couple years ago and it's still in great shape despite some heavy rains and snow. It's strong and relatively quiet in hard wind so long as you stake out the extra points on the rainfly. It's very roomy for two leaving lots of space for gear inside the tent. The vestibule is good sized as well. Ventilation is good if I leave the top of the doors open. It's a bit much for summer hiking but the extra space is well worth the weight--I'm 6'5"" and am able to stretch out completely in this tent. If I had to buy another tent, it would be this one again. I purchased this product in February, 1999 and have been pleased ever since. Quality and features like the big boys, but not the price. The seams are factory sealed on this 4 season tent. I don't know if I'd go too extreme with this thing, but based on 7 years of ""camping""in the US Army I'd say this is one of the better deals going. I have bought the Warp/2 in 1998. I am using it for long distance motorbiking (BMW). I was up in Montana, Colorado, Newfoundland during rainy conditions with gusty winds. The tent held up perfect, I had no leaks during a total of 2 months camping. It is very stable in gusty winds if guyed down. The tent is easy to set up with Walrus hub system but the rainfly requires a bit more attention to stake it out correctly. The factory stakes should be disposed of immediately and replaced by stronger Al products (REI). The Warp/2 ground tarp is an invaluable accessory given the odd shaped footprint of the tent. The tent has plenty of room, the entries are a little low for me (6'2""). The vestibule is large enough for two saddlebags. During very warm conditions it is difficult to vent with the rainfly on (Nebraska summer 1998). The guy eyes have started to rust which leaves stains on the rainfly. 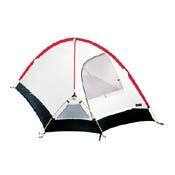 Overall it is a great four season tent with less usability in very warm conditions. It is little heavy for backpacking but perfect to put on a motorbike. I've had this tent for a couple of years. It's gotten snowcamping use and backpacking use. So far, I'm VERY please with this tent, especially given the price. In heavy, windy rain @ 11,000 ft, a well staked out Warp held up to 14 hrs of rain, keep us bone dry. In a windy snowstorm, my friend and I sat in comfort inside. The Included gear loft and 4 corner pockets are helpful, and the light color makes it fairly bright inside. Keeping vestibule open seems to reduce condensation, and 4 windows, 2 doors gives plenty of options. ONLY issues, is staking out the fly takes some practice, and may required some small modifications (the lower edge seems a bit loose, but can be easily shortened). Set up easy, take down easy after about the 3rd time. Enjoy! WE GOT ENGAGED USING THIS TENT ON MT.SHASTA, IT HAD PLENTY OF ROOM FOR 2 PLUS GEAR, WITH DECENT TIE OUTS NO PROBLEMS WITH WIND, GREAT VENTILATION OPTIONS, EASY SET UP AND BREAK DOWN, WE CANT AFFORD TO WASTE OUR MONEY, FOR THE PRICE CANT BE BEAT FOR A 4 SEASON TENT. CALLED THE REPS. AT THE WAREHOUSE SEVERAL TIMES PRIOR TO MAKING CHOICE, ALWAYS RECIEVED HELFUL INFO. If you want only one tent for four seasons, this is the one. It's light in terms of weight and price for a true four season tent. You can't go wrong with this one. Walrus customer service excels. They truly stand behind their products for the long run. I have slept in the tent in just about the coldest and the "worstest" that an Iowa winter can dish out before I moved to TX. This tent kept me and my companions dry and comfortable, while several others had problems that included condensation, leaking, and collapsing. This tent also has provided sturdy shelter in such exposed areas at Guadalupe Peak and Big Bend. Excellent tent, by far my favorite. I just wish it could use it in the hot and humid summers in TX. I have had my Warp/2 for three years now and simply love it - as the other reviews say, it is bomb-proof. This was proven beyond doubt on an extremely wet and stormy trip to the Needle Mountains in Colorado's San Juans last August at the height of the monsoon season. My partner and I had to spend 4-8 hours a day, every afternoon, sitting in it listening to the hail hammer the roof and watching the water flow under the floor with some interest, to say the least (since it would have taken us 1.5 days to get out at one point if the tent had failed). It held up admirably, and never leaked from above or below. The floor configuration strikes you as strange at first, but you will quickly realize just how much you can pack into it when you get used to it - it holds two guys and gear quite comfortably. Two small nits - it can be a little hard to ventilate in the summer, as can many other four season tents. And, after three years of four season use, one of the hubs that hold the tent poles cracked (but did not break). Walrus replaced it promptly. I had to replace a hub on the Warp/2 a while back - sent free from Walrus, no questions. I have also dealt with their customer service via email while exploring various options (such as replacing my Warp/2 fly with a 2+2 fly to gain an extra vestibule for winter camping), and find them very friendly and helpful. This tent is outstanding especially for the price. I have camped in this tent all over the place and have absolutely no complaints. While camped on top of a large peice of slick rock in the Needles region of Canyonlands I experienced very high winds. The winds were so strong that at one point they picked up my tent (with me and my seventy-five pound pack in it) in one swoop. The tent shifted about 5 feet. The tent handled it. It is bombproof. Buy this tent.